Medals and Bracelets Are Still Available! About this Virtual Run: With dozens dead, hundreds missing, and devastating wildfires still raging throughout the state of California, we here at Virtual Strides wanted to do something to help. 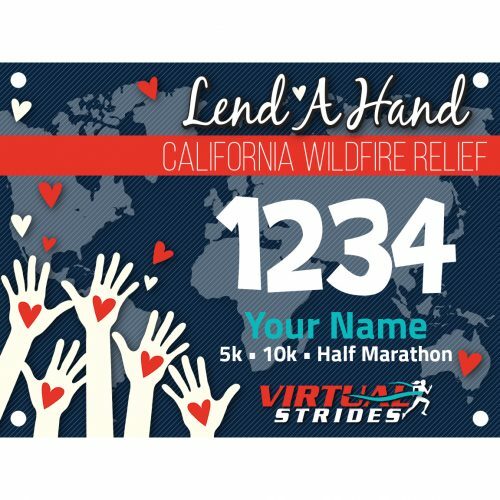 This virtual run is a simple and fun way for YOU to help those most affected by these fires. 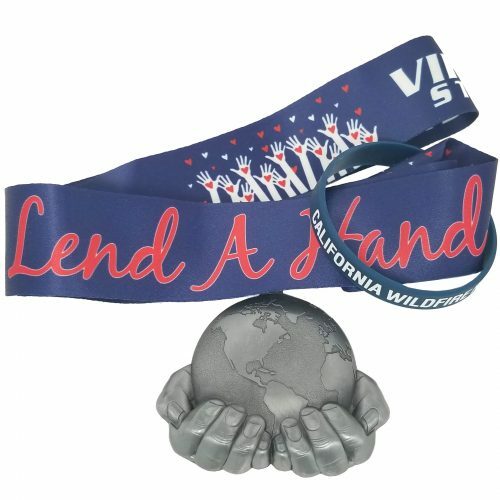 Similar to last year’s Lend a Hand: 2017 Hurricane Relief virtual race, we will once again be donating every single dollar raised* from this event, this time to California Wildfire relief efforts. Yes, that’s right – You pay $20 to register, and we donate all $20 to the cause. Participants in this global virtual race will receive a 3″ Lend a Hand finisher medal, a California Wildfire Relief silicone bracelet, a digital race bib, and a huge sense of accomplishment from knowing they are making a difference for people in need. You can run or walk anytime and anywhere you want to support the cause. 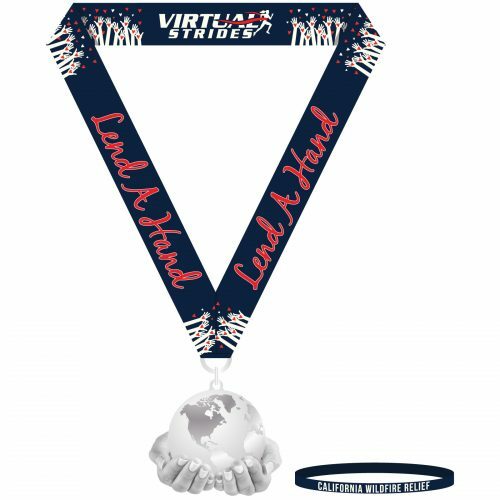 Please note: This is the same medal design as the one used for last year’s Lend a Hand: 2017 Hurricane Relief event, but it will have a different ribbon color and will be accompanied by a different silicone bracelet. This event is much more about helping those in desperate need than it is about the bling, but we wanted to make sure it was clear that the medal is essentially the same. PLEASE SHARE! We are operating with a shoestring budget for this event and cannot afford to advertise it heavily. Even if you are unable to participate, please SHARE this event with your friends! *Virtual Strides will donate $20 to California Fire Foundation for every registration made in this event through 12/15/18 up to a maximum of $50,000 (Registration will be shut down at that time). Because we are donating all of the proceeds from this event, we are unable to include free USA shipping like we do for everything else on our website. Domestic shipping charges are $5 for the first registration and $2 for each additional registration. 100% of the GROSS proceeds from this virtual race will be donated to the California Fire Foundation. This non-profit organization provides emotional and financial assistance to families of fallen firefighters, firefighters and the communities they protect. Formed in 1987 by California Professional Firefighters, the California Fire Foundation’s mandate includes an array of survivor and victim assistance projects and community initiatives. For more information about the California Fire Foundation or to make an additional, direct contribution, please visit CAFireFoundation.org.